The Valley of Elah is mentioned three times in the Hebrew Bible all in connection with the story of David slaying the Philistine Goliath (1 Sam 17:2, 19; 21:9). It is located 18 miles west southwest of Jerusalem in the Shephelah (foothills) of Judah. 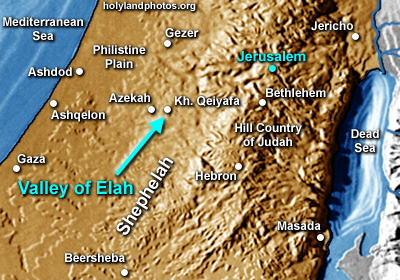 From here there is a convenient that leads east-northeast to Bethlehem. Gath of the Philistines is located 5 miles to the west and Azekah guards the western approach to the valley. On the hills to the south of the valley Socoh is located, and to the north the recently excavated Kh. Qeiyafa. According to the biblical text, it was here that David killed the Philistine "giant" Goliath (1 Samuel 17).